'Rock and Roll' is a song by English rock band Led Zeppelin, which was first released as the second track from Led Zeppelin IV in 1971. Befitting its title, the song is based on one of the most popular structures in rock and roll, the 12 bar blues progression (in A). 'Rock and Roll' stands as one of the best-known songs in the band's catalogue. Led Zeppelin guitarist Jimmy Page has said that this song came to be written as a spontaneous jam session, whilst the band were trying (and failing) to finish the track 'Four Sticks'. Drummer John Bonham was playing a medley of songs, which included a rendition of 'Keep a Knockin'' and Page then added a guitar riff. The tapes were rolling and fifteen minutes later the basis of the song was down. The song also included Ian Stewart on piano who dropped in for the jam. 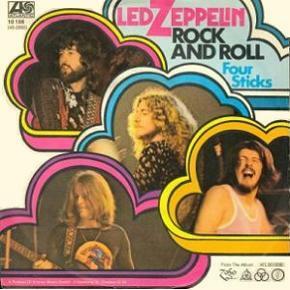 'Rock and Roll' is one of the few Led Zeppelin songs where all four members share the composer credit. 'Rock and Roll' was a key component of the band's set list at Led Zeppelin concerts from 1971 on. Initially, Plant referred it on stage as 'It's Been A Long Time', which is the first line of the song. In 1972 it was elevated to the opening number of all concert performances and it retained this status until 1975. For the band's 1977 concert tour of the United States, it became part of a medley encore with 'Whole Lotta Love', and during 1979 and 1980 it became an encore in its own right. When performing the song live, singer Robert Plant usually switched the second verse with the third. A live performance of the song from Madison Square Garden in July 1973 was recorded for the band's concert film The Song Remains the Same and accompanying soundtrack album. There is also a June 1972 live recording of 'Rock and Roll' which has been captured on the album How the West Was Won. In 1985 Page, Plant and Jones reunited and performed the song at the Live Aid concert at JFK Stadium, Philadelphia, as part of the Led Zeppelin set. 'Rock and Roll' was also performed as the final encore at Led Zeppelin's reunion show at the O2 Arena, London on 10 December 2007. On 7 June 2008, Jimmy Page and John Paul Jones joined Foo Fighters front man Dave Grohl and drummer Taylor Hawkins on stage at Wembley stadium to perform 'Rock and Roll,' along with 'Ramble On'. In 2006, Bowl Games of America used 'Rock and Roll' as the finale for the Gator Bowl halftime show. (The song was performed by 28 high school marching bands, with over 2,500 players.) The song is currently used by New York Mets first baseman Frank Corbisiere as a walk-up song, along with 'La La Land' by Demi Lovato. ↑ 'Classic Albums', 'Led Zeppelin IV', first broadcast on BBC Radio 1, 1992. ↑ The Heart of Rock and Soul: The 1001 Greatest Singles Ever Made - 1989. Da Capo Books. Retrieved on 2009-02-10. ↑ The Rock and Roll Hall of Fame's 500 Songs that Shaped Rock and Roll - December 1994. Jacobs Media. Retrieved on 2009-02-10. ↑ Top 500 Tracks - 1999. Radio Caroline. Retrieved on 2009-02-10. ↑ The 100 Greatest Rock Songs of All Time - July 2000. VH1. Retrieved on 2009-02-10. ↑ The 50 Most Exciting Tunes Ever.. - January 2002. Q. Retrieved on 2009-02-10. ↑ The 1001 Best Songs Ever - 2003. Q. Retrieved on 2009-02-10. ↑ The 100 Greatest Recordings From 1971 - 2007. DigitalDreamDoor. Retrieved on 2009-02-10. ↑ Hot 100 Singles - 15 April 1972. Billboard. Retrieved on 2009-01-17. ↑ Top 100 Singles - 22 April 1972. Cash Box. Retrieved on 2009-01-17. ↑ Top 40 for 1972 - April 1972. Record World. Retrieved on 2009-01-19. ↑ RPM Singles Chart - 29 April 1972. RPM. Retrieved on 2009-01-15. ↑ Top 100 Singles - 1 May 1972. Oricon. Retrieved on 2009-01-19. ↑ Top 100 Singles - 19 June 1972. musicline.de. Retrieved on 2009-01-19. ↑ Top 50 Singles - June 1972. PROMUSICAE. Retrieved on 2009-01-19. This page was last modified 06:18, 20 April 2014.